Webflow allows building production-ready, responsive websites without any coding skills required. Webflow lets you accomplish most aspects of web development and website distribution via a visual editor providing pixel-to-pixel precision. With a little help from Uploadcare, you can enable any Webflow site with serverless file uploads and allow its users to upload any media using a simple button. Once you create an Uploadcare account, navigate to your dashboard to create a new project or discover API keys for an existing one. You will need a public key: it defines a target project user uploads will go to. If you plan uploading non-image content, add billing info to your account. Copy the following code snippet. Go to the custom scripts tab, paste the script there, set your public key and hit “Save”. If you want to customize the look of your widget, you can add custom CSS here as well. 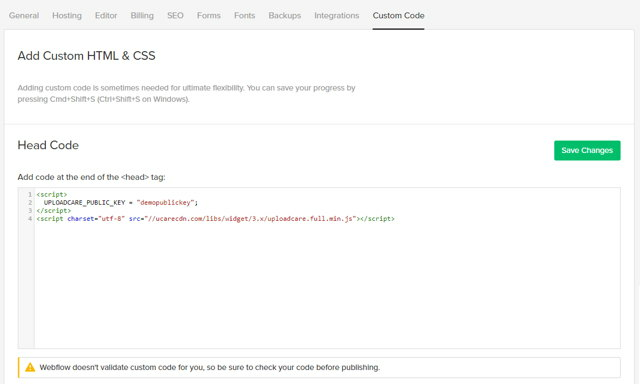 Open your website in the Webflow Designer and add a form block to the page where you want to add the upload button. If you already have a form, open it in the designer and proceed to the next step. Add a custom attribute to a new or existing text input which outputs as role="uploadcare-uploader" to allow the widget to work in your form. Hide that input by giving it a specific class, “hide,” for instance. Then, set it to display none in the Webflow editor. That’s it! Feel free to ask any questions around the Webflow Forum. We’re always happy to help with code, integration, and other stuff. Search our site for more info or post your question in our Community Area.